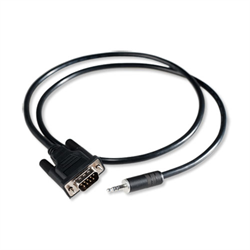 The Flex-RS232 cable connects to an iTach Flex IP or WIFI to enable RS232 (serial) communication and control. Cable plugs in to the iTach Flex and has a db9 pin serial connection on the other end. A gender changer is included to accomodate both male & female connections.